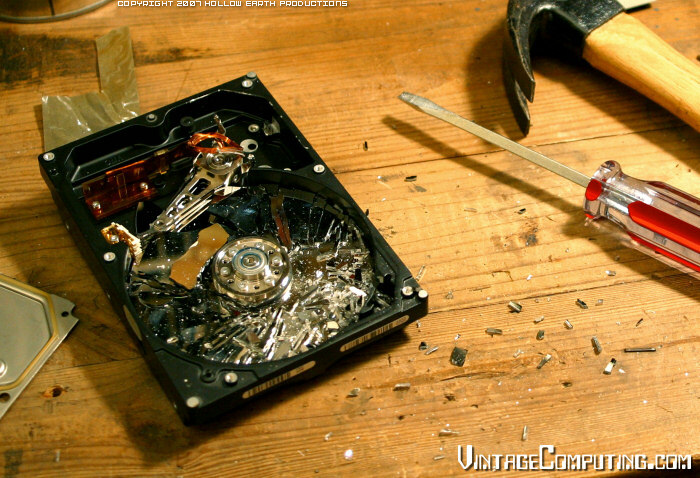 Kindasophically speaking: You think you can survive a hard disk crash? If you think about it, its kinda like the subject of death. Everybody knows that it is bound to happen. Its just a matter of time, some say. Yet, people would rather not think about it... and hope that its something that happens only to 'other people'. And even if you do prepare for it, or think you are for such an event, it is never pleasant and the results, often devastating! But life goes on!! Really. Unless you're resigned to good 'ole paper letters, listening to music from vinyl or CDs, watching in VHS of DVD movies and storing all your photos in reams of hardcopy albums, you're bound to have emails, MP3s, AVIs and JPGs which you need to store in the hard disk in your PC. The obvious answer, to protect yourself from losing data in a crash, is of course to backup. And there are loads of backup solutions our there which you can use. Just Google for "freeware backup software" or some derivative of that and you'll find more solutions than you need. Or, if you're too lazy, you can find a few useful ones here. However, I have a problem with the way most backup software works. Typically they take a complete backup of whatever it is you need to protect. And then, you'll need to do periodic backs to ensure the latest data get saved as well. The simplest way is to do a fresh backup every time. That means you backup an entire copy of everything you have (both old and new files) into a new backup image. Its simple, it has everything in one image. But doing full backups take a lot of time and a lot of storage space. You'd have to be super kiasu, super kiasi, and super rich to afford the storage for such a solution. The alternative is to do a one-time full backup of what you have at that time. And for the newer files, you do incremental backs. The software cleverly figures out what is it that has changed since your last backup and stores only those. That cuts down on the massive storage you need. But now, if you need to restore the data, you'll need the original image plus all the incremental backups to be able to restore things completely. Oh and depending on the software, you may not be able to access the individual files from your backup unless you restore the full image. Which is a major drag if what you need is just to get one single item from your years of backup! Honestly, I have never bothered with this kind of backup! What I really need is to be able to have a copy of the same thing onto another hard disk; and be able to access that backup the same way I would access my main data. In other words, what I need is a 'mirror'. This is where I introduce to what is likely the BEST MICROSOFT TOOL for this kind of needs. This tool is very simple to use... small and lightweight... fast... its been around and has been running reliably for me... and best of all, its FREE. Friends, if you don't already know what I'm talking about... its the one of MS' best kept secret, the MS SyncToy. What it allows you to do is to create 'folder pairs'. And you have a choice of using 5 different relationships between the pair of folders to achieve what you need to do. 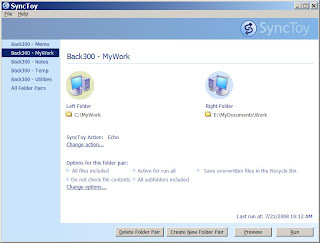 Synchronize - Whatever you do on each side of the folder pair is replicated to the other side. Useful when you need to work on both folders and want all your changes to be reflected to the other side. It just take a minute to set up your folder to be backed up. And running it requires just another click. The initial run for a new folder pair will make an exact copy of whatever is it you have on your souce folder. For subsequent refreshes, SyncToy intelligently and very quickly scans through and only picks out the updated files to act upon. A couple of pre-requisites though.... Firstly, you need to have the MS .NET Framework for SyncToy to work. (yeah, groan!) Secondly, get yourself a second hard disk. It wouldn't be much of a backup if you copied your data back onto the *same* hard disk, right? Still wondering if you can survive a hard disk crash? If you already have a backup solution, PLEASE continue and be diligent in backing up! If you don't have one, then give MS SyncToy a try -- you'd stand to lose more by not doing anything! This tool isn't perfect though! After a while of using it -- especially if you're not careful with configuring your folder pairs -- you'd end up with the potential problem of having too many duplicate files in your target folder. Its not life-threatening or anything!! Just an annoyance. But fret not, in my next post, I'll talk to you about another nifty tool to fix this problem! This is where Mac users is gonnna have lots of bragging rights. I use a software call SuperDuper (cool name). Back up entire hardisk, adhoc or schedule, mirror or incremental. HDD crash? No worries, just boot up from external HDD from Firewire as if nothing ever happened.... Then take your time to replace a new HDD and SuperDuper the entire content back to the new HDD. Thanks for sharing that WLE! Hi, Thanks for the site. I dont know what blog means or even how to use this site. Took me half an hour to find where to write this comment. But I am in deep trouble and need some help. I have used SyncToy on two separate ocassions. The first installation was v1.4 I think. I had a WD Passport external hard drive. I am running Vista Business. The mongrel thing was already installed on my laptop at purchase. I set up the folder pairs no problem. I ran echo on all folder pairs about 12 times threabouts. Perfect. Then out of the blue when running the echo of all folder pairs came the window that each folder pair did not exist. When looking closer, the directory of the right hand folder in each pair had been changed. The correct right hand side directory should have been showing "F" drive as the prefix for all right hand folder pairs in the echo operation I was trying to run. But instead it was showing "E" as the prefix. I never changed this. Something else changed it or whatever. So I discontinued use of SyncToy until I noticed there had been an upgrade to V2.0. After uninstalling the old version and reinstalling the new version, the same history happened all over again after about 12 echos for all folder pairs. Do you or anybody else know how to stop this occurrence. SyncToy is almost brilliant when it is working. One flaw I noticed was that when I deleted a folder on my computer and then ran echo the change did not occur on my external drive. The deleted folder still appeared. I had to manually delete it? I hope there is someone out there who can solve this problem. SyncToy is very convenient when working. As I write this though I am having to manually having to transfer all folders in my computer to te external hard drive. Its taking hours each time. Dear Scooba, sounds like a problem where your windows decides to assign a different drive letter to your external drive... did I understand that correctly? If it is, then don't worry, its a fairly common problem. I used to tear my hair out when iTunes and Picasa couldn't find my music and photos respectively when suddenly one day the drive letter got changed. The easy way out of this is to change the letter back to the one which you used to set up your folder pair. - on the left window, click on "Disk Management"
- Right-click that HD and select "Change Drive Letter and Path"
- BE VERY CAREFUL WITH THE ABOVE SELECTION..... because if you click the next one, it would be to FORMAT your HD....!! Dear Center Parted, You are truly great for even responding to my distress message. Thank You indeed! But alas, no. It is not Windows that is assigning my external hard drive a new prefix. My external hard drive still shows up as "F" drive. The change is actually occurring inside the tool "SnycToy". The folder pairs that I establish during initial set up of SyncToy are from "C-etc" to "F-etc" drives. But when SyncToy starts playing up and saying it can not find the folder pairs, it states it can not find the folder pairs "C-etc" to "E-etc". For example I only do "Echoing" from left to right ie from "C" drive to "F" drive. Let us say that I am doing an echo on changes made on a folder in my computer "C" drive called "pictures". During initial set up of SyncToy I will establish a folder pair that will look like "C/pictures to F/pictures". When I select this folder pair in the SyncToy directory and then select "run" on this folder pair from the options at the bottom menu of SyncToy, SyncToy will display a window saying "can not find the folder pair "C/pictures to E/pictures" which is a folder pair that I have never established in the first place. It is quite bizarre. GOing back into my computer and opening up "C" drive, my external hard drive is still nominated as "F" drive. Can you help please? Cheers Scooba. P.S. Thank you for your time in any case. But if you're looking for a quick fix, how about using the steps I mentioned in my post, and change your 'right-hand' drive to 'E' so SyncToy can find it? Hopefully that will keep you synchronizing until a long-term fix is found...? I have not had the opportunity to use your suggestion as yet regards the changing of the directory somewhere in the system whilst using SyncToy. However the problem has not arisen again. The only hting I have changed is that when disconnectiong the external drive, I use the tool "Safely Remove Hardware" and ensure that I remove the correct Drive Directory ie in my case "F" for the external drive. I have now used SyncToy without problem since. However if the problem arises again, I will definitely reassign the directory using the procedure you have given me........Thank You........for taking the time to help me. Sincerely...Stephan Driver. My friend and I were recently discussing about how technology has become so integrated in our day to day lives. Reading this post makes me think back to that discussion we had, and just how inseparable from electronics we have all become. I don't mean this in a bad way, of course! Ethical concerns aside... I just hope that as technology further innovates, the possibility of transferring our memories onto a digital medium becomes a true reality. It's a fantasy that I daydream about almost every day.